I'm #37 and have yet to be asked for final payment. Thought I would have gotten that request months ago, but I'm glad to wait rather than have Spooky rush anything out. May only be about ten people that have them so far. I know at least one in the teens that hasn't gotten theirs yet. I played this game on location and it was already having mechanical problems. I think one of the slingshots was broken. Seems like every game out there should be too new for that. Well, I guess you won’t be buying one. That’s the way it is. No disrespect. I played just it at Pincinnati show. Great game. Waiting to rate it when I can hear the audio, but sure I will be rating is very high. FYI, the game was sold to Crazy Martin's Arcade in Piqua Ohio. Sorry, don't know the game number. From my experience with Spooky the location games go out first. They're also concentrated on finishing up the TNA run. Be patient. I’d guess 450, or so, would be max production. Alice Cooper’s charity gets a few as well. If you aren’t in now, look to the secondary market. Not bad, but that’s what your left with. Spooky has put their life and soul into pinball. Not many can say as much. False. They are still selling. I used to be big spooky fan but talk about a game being doa. This has to be one of the worst launches ever. Grudgingly have to agree. I bought both AMH and RZLE. Very disappointed with Spooky at the moment, for delaying final code on RZ, and for how ACNC has been presented. I see what you are saying, but as a buyer I don't feel that way. I know they are a tiny company especially compared to other manufacturers. I feel like they sold way more TNAs than they expected and it put them behind schedule. It is a good and bad problem for them. Now that they wrapped up TNA, they are shifting to full time ACNC. I also don't see this as being a worse launch than Alien, Predator, or Big Lebowski.... They are making games it is just taking some time. I don't think it is DOA. It is in the middle of super competitive market place right now i.e. Munster's , Monster bash , to name a few. But the true ACNC fans will buy it. It can become taxing to wait for pins in a world of instant gratification. I hope to see more ACNC pins out in the wild and peoples reviews..
My advice is not to get overly fixated on checking Pinside everyday for ACNC numbers to pop up. The few out there are for location games or folks who agreed to have them opened at a show. So, numbers are all over the place now. When they start shipping on a regular basis and get into the 30-s or 50's, then numbers will start to mean something. However, also note that butter cabinets are made in batches. So again, that will throw off the count for those who insist on keeping up with the numbers. I learned all this as a TNA buyer. But two things are for sure: 1) Spooky will make and get you your game, 2) it will be a great game with great quality and quality support. Just BE PATIENT. I’m not buying anymore nib spooky after rz and the bugs and code still not being finished. I do feel that spooky really lost a lot of sales of acnc by not getting it to market soon after announcement. There’s just so many options it’s hard to wait 1-2 years for a game vs buying huo later. Especially looking at rz resale prices. I just noticed that fightnightfz has spot #338 spot for sale at $500. That's a great deal for NIB pin. Drops that ACNC to $5995.00 that less than a new stern pro..
... Drops that ACNC to $5995.00 that less than a new stern pro..
Not quite. New Stern Pro is more like $5600 shipped. That Alice Cooper is still $6k + shipping. Let's call it $6400-ish. $500 off ain't bad though if you want an ACNC. I find it concerning for acnc sales that someone is actually willing to lose 500$ on a deposit and no one immediately jumped on it. Not purposely trying to be a Debbie downer just my observations. Tna is pretty cool though, might grab a used one one day. Downvote for being correct thelaw ? I think it has a lot to do with people wanting things now. That is why every Stern reveal goes over so well. They reveal the game and it is basically out. I'm not saying it is wrong or right, just an observation. MSRP isn't the real price so I don't know what to tell you. So what is the real price of ACNC? I think it’s 6500. Rz was 6000 but they put thru an increase, another reason I’ll be out on nib spookys. I know this is overly optimistic way of looking at it, but they are perhaps a victim of their own success. I don't think they were planning on TNA selling 500+ games, nor do I think they were expecting ACNC to sell around 80% their games so quickly. Prior to those two games they produced what, a little over 500 games in five years of operation. Now they are ramping up to produce over 500 games a year. TNA is the only new game I've ever owned. While I'm perfectly happy, I'm still very cautious about putting money towards any new game. I want to make sure I'm happy with what the game currently is, before putting down that kind of money. I think that's good advise regardless of which company you're buying from. This I what I was sold for spot #66 . Best guess is people are losing enthusiasm for this game. Too much time passing by. Too many new game announcements since. People with very low numbers (<30?) still waiting since June. #400 in line seems light years away. Once these start shipping en masse and more people get to play it, if it's good, demand should pick up. Apparently very tough sell right now. Best guess is people are losing enthusiasm for this game. Too much time passing by. Too many new game announcements since. People with very low numbers (&lt;30?) still waiting since June. #400 in line seems light years away. Apparently very tough sell right now. It is like flat soda. There is (like always) another percention by a different target consumer here too. I could not care less about pursuing ownership of Sterns current product. It doesnt provide a value to me. Damn they are fun though. While they are doing more to promote the hobby than all other competitors combined, i wont pay to have a Spike game in my house. While there are people that are running away from this delay and disappointing lack of communication, we knew what we were getting into i think. I want something designed and engineered by a passionate team. Giving them a shot. I want something designed and engineered by a passionate team. Giving them a shot. It's just the problem with being a small company. You have to announce & show stuff to get people excited aboot the next coming product, but with that you risk burning people out. As I've said before, I played on in April and it was bar none the worst playing modern pinball machine I have EVER touched (no on Thunderbirds, yes on Dominoes), and I'm willing to give it another shot...but I wont be going out of my way. Magically Charlie just posted today they finishing up 6 more tna then full blast on acnc which only has a few spots left. Good news for those pre order people. Bad news no more nib tna for now. Code on ACNC is FINALLY where it's making us all happy here. I'm also to the point where daily duties allow me to actually jump in to help direct my own actual game play, not to mention the team is bigger than it was 1 year ago and working well together (which doesn't happen over night). Yep, we drug our feet to get the ACNC code caught up, fixed some buggy RZ issues, added crucial talent to the team, and oh yeah... built more games in 2018 than we ever had before. About 520 TnA's out the door. Said it before, we stepped up TnA production to get the plate clear and do nothing but ACNC. Ummmm.... spot on?! Yep. We NEVER expected TnA to go over a couple hundred units. ACNC sold a massive chunk fast. 1st & 2nd best selling games back to back. Good problem, but still a problem. So let's do the math... we have 6 TnA's left to build and ACNC is already taking over the production stands. 520 games done last year, it's January 10th, and the only game currently on the production schedule for 2019, is ACNC. We promised to ship them all in 18 months or less. We will do just that. Rz was 6000 but they put thru an increase, another reason I’ll be out on nib spookys. Going full HD and full RGB ain't cheap... but, you stay on par with everyone else or fall behind fast. Considering we sold more games in 2018 with the new system than all the games in our first 5 years of existence combined, I'd say we made the right decision. We have never claimed to be perfect, but we'll never stop trying to get there. I think this year is going to be fairly freakin' amazing... to say the least! Peace and pinball people. Life is damn good! Thanks for the update, Charlie. Thanks for your characteristic communication and transparency. This makes complete sense to me. I can hardly wait to receive my ACNC! I've had my own small business for 20 years (20th anniversary in April). Selling board games on the Internet. Sales of $4k the first year and now over a million yearly. Rode the growth wave and our fundamentals are doing well (zero debt and making a profit, even after they pay me) - even in the face of product and competitive oversaturation to the point where competitors are starting to go under due to a lack of sound fundamentals of running their businesses. So I've seen it all for a timespan of 20 years -- for my own market -- a target demographic which isn't unlike that of Pinheads (board game geeks and pinheads are usually different animals, but there is some crossover in general characteristics for sure LOL). The problem is: running the business. Cashflow. Managing growth responsibly. (Down the road: managing too much competition and oversaturation of product. 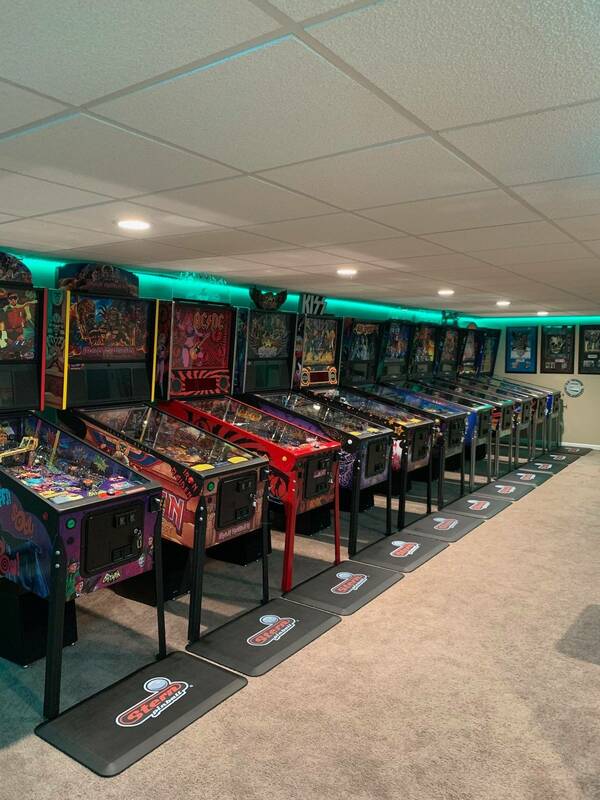 Pinball isn't there yet, but it may be coming (the old supply vs. demand problem). When this hits, the companies that manage their money and resources well (like Spooky) will survive, those that don't manage the business will be gone). 1. NEW: This is always #1 for the business owner to understand. (To paraphrase Don Draper, what is happiness? It's a moving target.) And baby, to state the obvious, that target moves WAY faster now than it did in the 1960's! The dirty truth is, if you put production first, ahead of promotion...you will not survive. You HAVE to have hype and interest for what is "upcoming". This makes your customers happy/excited. For pinball, this means hyping the "new" and obtaining some down payments to generate cashflow to pay suppliers (if you don't pay those you are dead) and the folks who work for you (without them, you will work insane hours and/or you are dead anyway). There are loans available, too...but these always need to be paid...and the larger the loan, the greater your business' general liability/weak financial position and possible compromised future position if times ever get lean. How do you produce something like a pinball machine FAST? Answer: you don't. It's insanely complicated and has to be done 110% or the damned thing doesn't work and creates MORE problems/expense...and public bitching/bashing/pitchforks on Pinside. Currently, everybody wants everything yesterday. In pinball terms, Stern is humongous and the bully on the block (albeit a friendly bully -- I love my Sterns, I have a few). 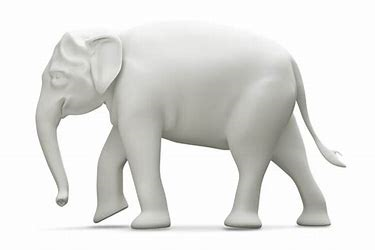 They can tease a release, then hype it to death...and then actually *produce* the freaking thing in crazy numbers because they are huge and established for decades. 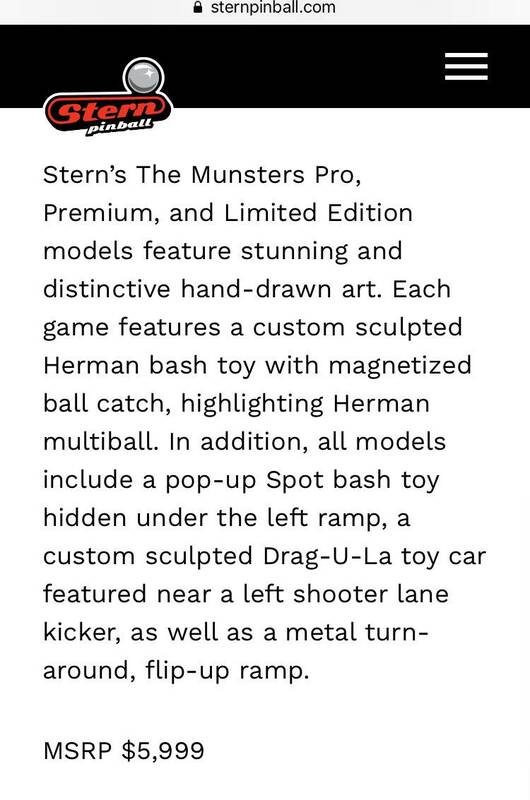 And, since Stern understands the almighty rule #1 (see NEW above)...they actually are cheeky enough to release a table that some might consider "incomplete" (LOL insert huge argument here) and then offer code updates from time to time (even small code updates will make people happy because happiness is a moving target). So, a company like Stern has a huge advantage over the others. It is absurd to compare a company like Stern to a company like Spooky -- at least, at this time. In quoting the numbers of production in 2018 (which don't completely resonate with us, since we don't know the insanity that is creating a single pinball machine, let alone hundreds), I think Charlie is trying to communicate his satisfaction in dealing with and handling growth. It sounds like they have a larger facility, more and better staff, and probably have modest debts, if any. Since everybody wants things FAST, the lack of ACNC production has perhaps become a black eye for Spooky in the public domain...but as a business owner, I understand the principle that they have handled growth more or less in stride and are more capable than ever to produce machines -- as they prepare to pump out ACNC (which is more polished than if they had shipped it in greater numbers last summer). In finishing TNA production and growing the company in stride, they have put the horse before the cart. Is it frustrating? Yes. But I understand the struggle of dealing with insane growth in the face of running a company on a daily basis. Will ACNC be perfect when I receive it? Nope. Of course, there will be those code updates and there might be things that appear to be "unfinished". But I'm pretty sure it will be damn fun, have great music, will be challenging, have depth...and it has freaking Alice Cooper and splashy comic book style art!!! (I've even warmed up to Alice's laconic delivery on the callouts). I bartered my spot at #112 for a deal on a Tron but purchased back spot #114 (losing $100). As a lifelong Alice Cooper fan, I'd rather have ACNC than Munsters or the MB remake. Two great posts above. 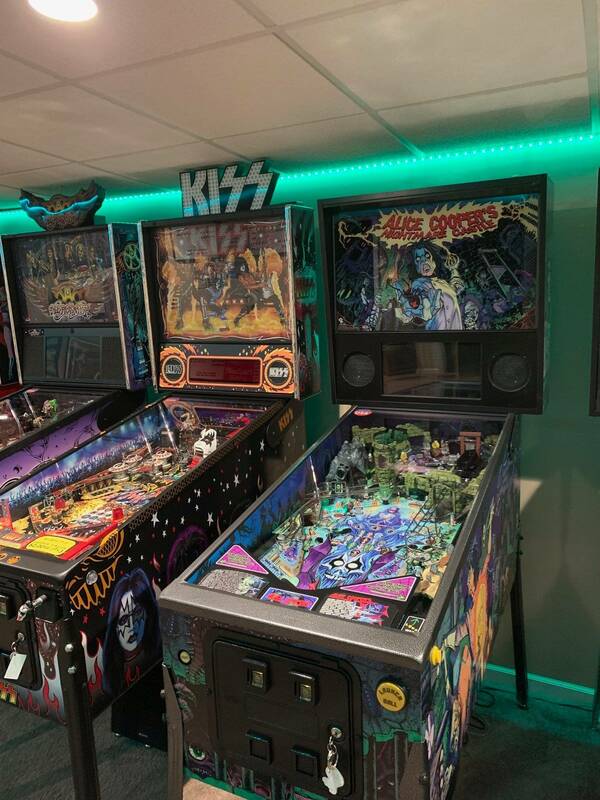 Thanks spookycharlie for patiently coming back and restating your clear passion and commitment to pinball (and your customers). Thanks pinballer67 for sharing your personal experience and giving us another dose of reality here. Patiently awaiting my ACNC with the same build number as my TNA. Spooky, keep doing what you do - many of us here love ya! The problem is: running the business. Cashflow. Managing growth responsibly. This entire post is well thought out, and coming from someone who has been there... we've had every opportunity in the book to do investors, bigger titles, faster growth, etc etc. None of it matters if it ISN'T SUSTAINABLE. We have kept it internal 100%, and learned as we've gone. Here's the truth. We're finally to the point where we DON'T have to rush on the next game. TnA was a big unknown, but it worked out and bought us some time we desperately needed to get ACNC right. The next game, NOBODY will see until the code is much farther along and it's about ready for production. The market is flooded, and it's going to become more so. Good games will always stand out, and we need to make sure we have the time and resources to do just that. We have the people in place we need, and there are NO MORE VALUABLE RESOURCES THAN GOOD PEOPLE. Back to work... thanks everyone! Got a ton of new ACNC code to test and customers picking up TnA's at the shop today... we love when they do that! When will Spooky start providing manuals, schematics, parts catalogs with their machines? Tons of on line info on our website now, and nothing parts wise that can't be found with 1 email or phone call right now, but yes... we are working on making the documentation more physical. It's an immense task to say the least. Another code update has been issued today.